This Fillo Riccota Bundt Pie recipe is sponsored by The Fillo Factory. All opinions are always 100% mine. Need a dish that is a feast for the eyes and the taste buds? 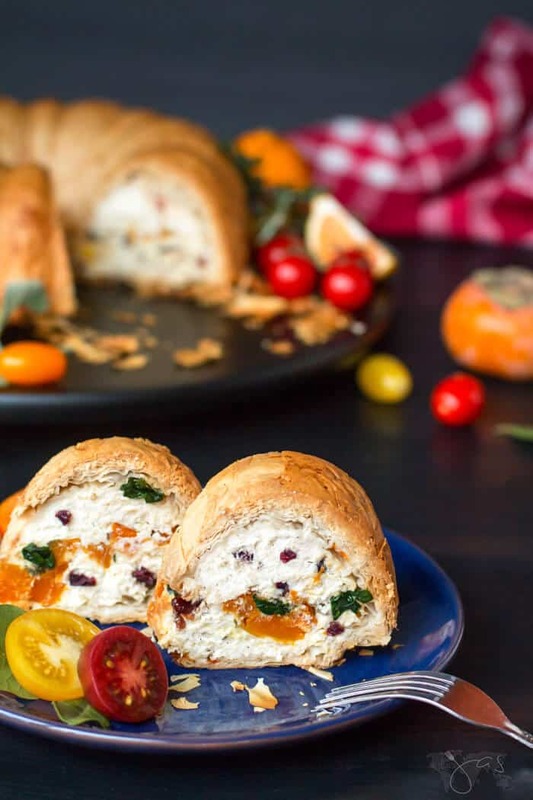 This Italian fillo ricotta bundt pie with butternut squash and spinach fits the bill. Add a burst of color and flavor to your table this holiday season! Although fillo pastry is a staple ingredient in my home country, it took me over 40 years before I made something with it. I was intimidated by fillo for no reason. Once I made the traditional baklava, I even tried my hand at making the dough from scratch for the meat pie. 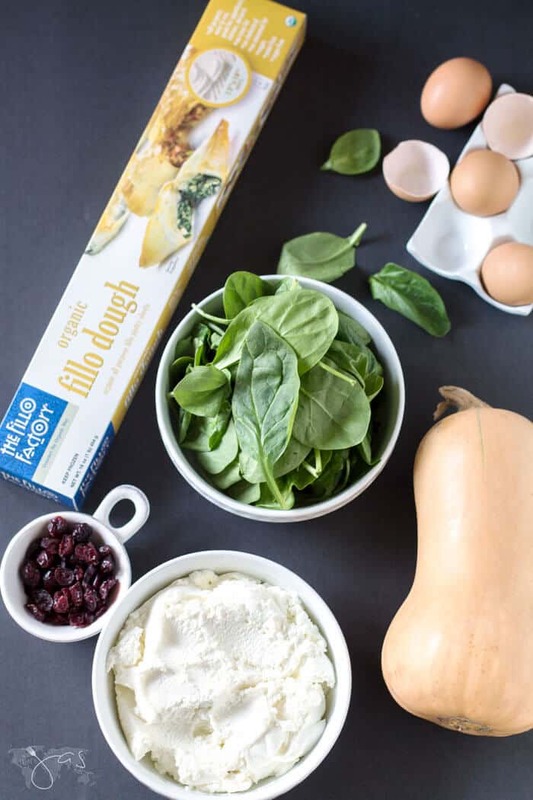 This ricotta pie is made by placing sheets of fillo into a bundt pan, then filling with ricotta cheese mixed with Italian seasoning, parmesan, mozzarella, and dried cranberries with a layer of roasted butternut squash and spinach. Talk about colors and flavors, you guys! 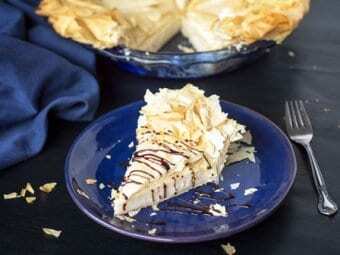 The pie is delicious warm or cold and makes an impressive centerpiece. *Make your own Italian seasoning with herbs you already have on hand. 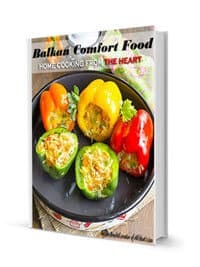 Download my FREE 30 Easy Homemade Spice Blends e-book. Add ham or prosciutto to the pie or instead of butternut squash and spinach, if you prefer. Don’t worry if the fillo sheets tear during the process. It won’t be visible when the pie is baked. Arrange the butternut squash and onions on a shallow baking sheet. Season with salt and pepper and toss with the olive oil. Bake until the squash is tender and lightly browned, 20 to 30 minutes. Remove from the oven and add spinach. Mix to combine. Return the baking sheet to the oven and turn the oven off. Meanwhile, in a large bowl, combine ricotta, parmesan, mozzarella, cranberries, eggs, Italian seasoning, salt, and pepper. Generously grease a 10-inch bundt pan with some of the melted butter. Place 2 sheets of fillo on top of bundt pan. Poke a hole into fillo where the center tube is and gently push fillo into the pan to line it. Continue fitting fillo sheets into the pan, turning it as you go in order to make even layers (the sheets will overlap in the center hole of the pan) until all sheets are used. Edges of fillo should hang over edges of the pan. Spoon half of the ricotta filling into pan. Spread the roasted butternut squash and spinach over ricotta, then spoon the rest of the ricotta mixture on top. Fold edges of fillo over filling. Using a sharp knife, poke many holes in the dough that reach all the way to the bottom of the pan. Slowly pour melted butter over the pie (some butter will remain on top of the dough). Place pan on a baking sheet and bake at 400 degrees Fahrenheit for 1 – 1 1/2 hours, or until pie is puffy and golden brown. If the top is getting brown too quickly, cover with a piece of aluminum foil. Allow pie to cool in pan. Place a wire rack on top of the pie and invert. Transfer to a serving plate. Serve warm or cold. 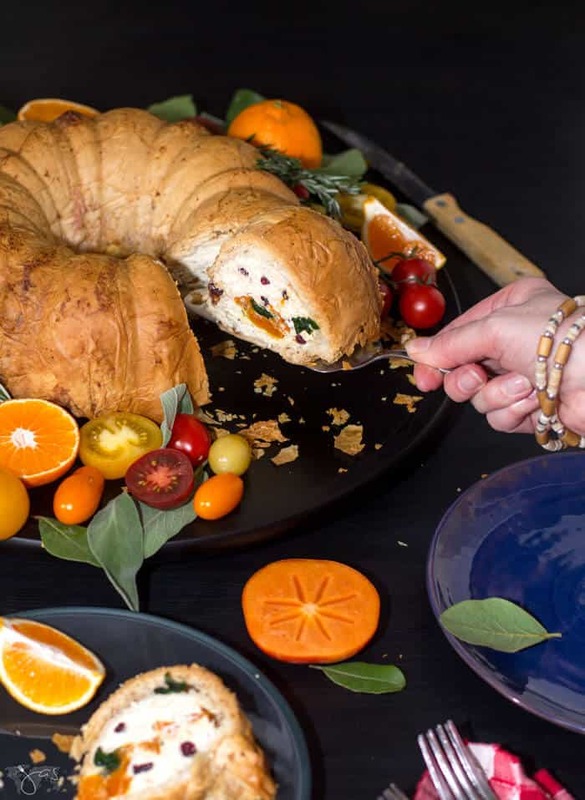 Festive Italian fillo ricotta bundt pie with butternut squash & spinach is a feast for the eyes and the taste buds. Place pan on a baking sheet and bake at 400 degrees Fahrenheit for 1 - 1 1/2 hours, or until pie is puffy and golden brown. If the top is getting brown too quickly, cover with a piece of aluminum foil. 10. Allow pie to cool in pan. Place a wire rack on top of the pie and invert. Transfer to a serving plate. Serve warm or cold. Don't worry if the fillo sheets tear during the process. It won't' be visible when the pie is baked. Featured on: The Lazy Gastronome, Little Miss Dexterous, My Girlish Whims, Katherine’s Corner, Her Tool Belt, Designs by Gollum, Fiesta Friday, The Cottage Market, Scrapality, and Nifty Thrifty Things. This looks pretty good, and now I understand why the couple of times that I’ve tried using phillo, it failed-o miserably. For some reason I thought you had to brush butter between every layer – greasy. Very greasy. Usually, you do have to brush between each layer for most fillo recipes. I actually just drizzle a bit of butter instead of brushing. Try that next time 😉 Happy Thanksgiving! This sounds wonderfully rich and delicious! Thanks for sharing at the What’s for Dinner party! How beautiful and unique! Pinned! Beautiful! So perfect for the holidays! Such a clever idea! and beautiful photos!! This looks so delicious and your presentation is gorgeous. I’ve pinned it and will definitely give it a try. Thanks for sharing the recipe with Share Your Style. Oh, my gosh! This looks SO good! I am literally salivating! Thank you for sharing! When I’m brave enough, I’d love to try it! I’ve never been great with fillo. 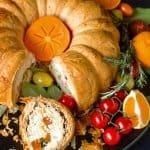 Never thought of bundt tins for savoury somethings! Genius. Thank you. Got to try this. I wish I could claim the idea, but someone else was smarter than me, lol. Thanks for stopping in, Harriot. Hiya, Jas! I saw this over at #BrillBlogPosts and just had to come check it out. I too find fillo dough intimidating: I made it once, and although it turned out amazing, I can’t imagine ever doing it again. Using pre-made dough—and in a BUNDT pan!—is genius. I will definitely check out the Fillo Factory’s version of Fillo Dough, because I’m sure that it’s better than what I’ve used. This cake is just gorgeous! It’s a conversation starter all by itself! Hi, Michelle! You can do it, show that fillo who’s the boss, lol. I love Fillo Factory fillo because is organic and they offer a different thickness of dough, so it’s not as fragile as some other brands. Hope you give it a try. Thank you for stopping in and have a great weekend! OMG that’s so gorgeous! We’ve got a party in just over a week (eek!) and this would be a stunner on the buffet table. Thanks so much for sharing at the #happynowlinkup! Thank you, Leslie! It is different for sure. 🙂 Happy partying! That’s a very creative way of using fillo dough. 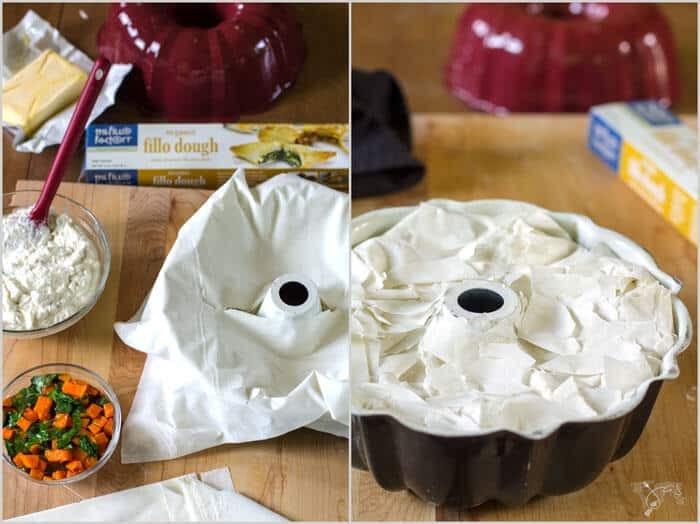 I used to work in pastry, but we never thought about using it inside a bundt pan. It comes out great looking. I bet it taste yummy too with that filling. I need to try that one day. Wow, that is one beautiful and delicious looking feast! Thanks for sharing with SYC. My family are vegetarians, we would love this!! What a beautiful dish! I’ve been intimidated by filo pastry too – but after reading this post I think I will give it a try, Jas. Your bundt pie is perfect for entertaining and great for those who don’t eat meat too! Thank you so much for sharing and for being a part of the Hearth and Soul Link Party. Pinning and sharing! Hope to see you at the party again this week! 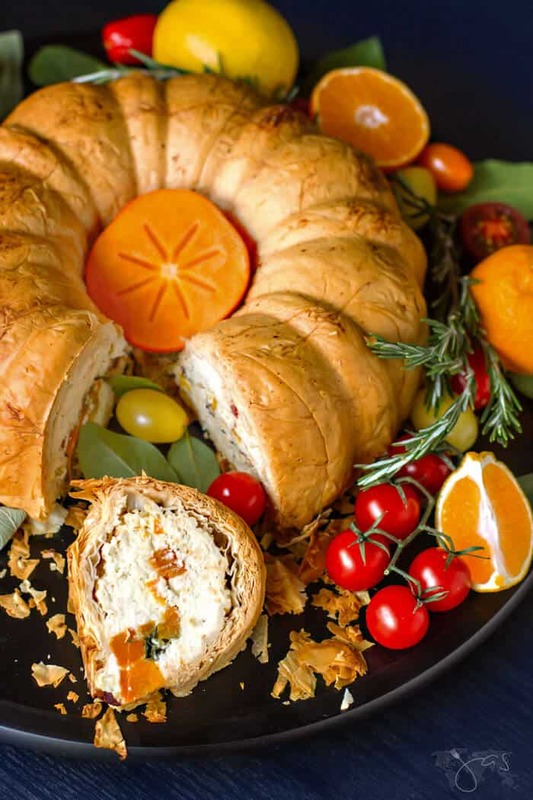 What a beautiful presentation for your Fillo Ricotta Bundt Pie and would be delicious! Hope you are having a wonderful week and thanks so much for sharing with Full Plate Thursday. Aw, thanks, Miz Helen! Much appreciated. This really sounds so good! 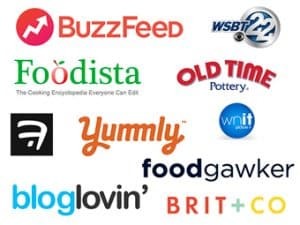 Thanks so much for joining the To Grandma’s House We Go link party! Oh my goodness Jas, this looks absolutely amazing! I definitely want to try it!